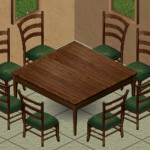 Velvet Side Chair | Dining chair intended to match the Poissons De Vol Café Sofa and Grim Sims Armchair. 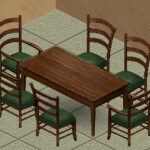 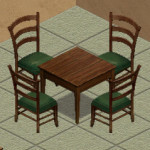 Brown Dining Tables | 1×1, 2×1, and 2×2 dining tables intended to coordinate with the Cafe theme. 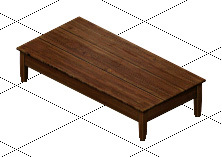 Brown Living Tables | Coffee table, end table, and sideboard tables intended to match the Unleashed Cafe theme.